MY WATERY WORLD is now MY LIFE. The challenges of the water are not only about staying afloat. We've had training for that. 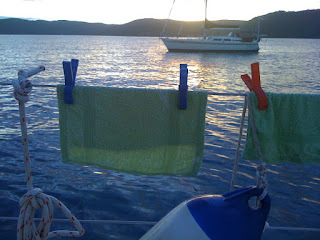 Now that we've lived aboard for two weeks we've been learning to deal with: washing, bathing, cooking, washing dishes over and over again, hygiene, hydration, cleaning, (with water tanks of a capacity of several hundred ltrs, exact amount unknown), leaking seacocks, leaking toilet connections, total toilet failure requiring total replacement, sailing a dinghy and then loosing the gear overboard as speed boats zoom past, keeping our living quarters dry and lowering humidity, water ingress (unexpected leaking cabin roof in directional rain), and just having gear fall "in the drink" requiring a quick update on knotting techniques. I've developed a few tricks: I use lots of paper towels to wipe food off utensils after meals prior to washing up. I often use a tallish rectangular container instead of the sink which makes a deeper washing bowl using less water. I've been given a rotating hand cracking washing devise that works on little h2o. The rinse water is used for toilet flushing, or general deck cleaning. When away from marinas we have a "bird bath" in a big flexible plastic tub and scoop warm water over ourselves, then flush that into the bilge for pumpout. When the kettle boils I always put excess hot water into thermos flasks. These keep it almost boiling for almost 12 hours, and can then be used for bathing etc. We try to stay away from marinas that often charge $ for very little in return. However, laundry facilities are enticing. We've managed fairly well despite the unseasonal damp! Only one day of good sunshine, and another with good drying winds. Ventilation is important for moisture controll and we try to have every window open when possible. I flip the double mattress more or less daily, because condensation build up will lead to mold and mildew (allergies, asthma). We have painted floorboards and use throw down mats because marine carpet holds moisture and stinks really quickly. Oh and vinegar is a great clean-all, it inhibits mold growth, and I apply it in a spray bottle. A drop of detergent helps too. Anyway that's it for now: we're off to PALMBEACH, having successfully anchored off the beach overnight for the first time. We'll be using the dinghy (rowing, because the outboard has given up the ghost)to transport our groceries. Our dinghy"MAD MAN" is now our life line to civilization, and needless to say we've had breakages with the simplest of oar locks several times. I'm now titled "Jen will Fix it". As someone said: Cruising is about sailing from one exotic destination to another to attend to expensive repairs. ps: as yet no surf for Glenn and the three borads. Well whats happened since our last update? We sailed from Cronulla to Pittwater on Sunday in company with Chilli Heat with Bruce and Sue at the helm, well in company for awhile that is until we lost sight of their stern. We elected to sail with just our head sail and were achieving 7 knots in the early blustery conditions, when arriving at Sydney heads,and as conditions eased, Chilli Heats crew decision to sail with double reefed main and head sail proved to be a winning combination. 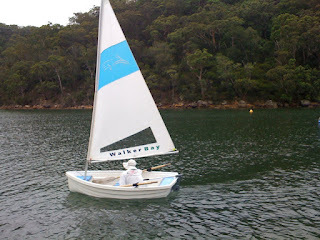 But hell I'm the lazy sailor and was happy to coast to Pittwater with our original sail configuration. Winni the windvane steered Crazy all the way with a minor adjustment here and there. We are now experiencing nice weather, after days of rain, rain and more rain. The weather has certainly been a challenging introduction to our new way of life, but we are still not deterred. We are finding the challenges and relaxation to be quite envigorating. 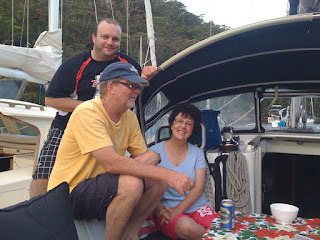 We have met up with some old sailing friends and Bruce and Sue held great party last night on board CH for 10 people(well done again B&S), with delicious Chilli Beef, which proved to be a all round favourite(especially the next morning with Bruce's toilet) It was great to once again play guitar with Rob until the early hours of the morning and the enthusiastic go go girls and back up singers kept all others in the anchorage awake! Another big night is planned for New Years Eve. Right now we are anchored in the shadow of Barrenjoey Lighthouse and a whisper away for a glassout and a surf in the morning. We hope to be heading south on New Years Day! What a tiring few days it's been. Glenn is so keen and enthusiastic about this sailing adventure. His three surfboards are lashed onto the lifelines. (Thankfully a fourth was sent home with a neighbour). I am the crew responsible for the mooring (driving) of Crazy and have trouble seeing over the dodger down to the bow at any time. Now my view is obscured by the board cases. I sort of park by Braille with the help of vague and at times dramatic hand signals. Fortunately I can't actually hear anything Glenn is saying. I'm not sure if any of you realize that surfing and finding a really good wave is the basic motivation behind our trip. We see this as a shakedown cruise to sort out any problems in our systems. 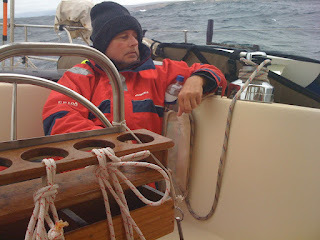 I am often just tired by Glenn's relentless optimism that the wind is right for a sail. The sails are set and then we sit back and watch them flap and slop about. He is never really discouraged by the fragility of the weather, and is great fun to travel with. I'll try to contribute more often to this blog, at the moment I mainly act as an editor. A big hello to our newest blog followers, "Uncle Simon and Lynda my sister, Miles and Izzie" in England. Thanks for following; also to the Tabourie crowd of friends, especially Little Sue who I really didn't get to say goodbye to, (the ginger extract is a big help) and my amazing work buddies. Could someone send my love to Molly? 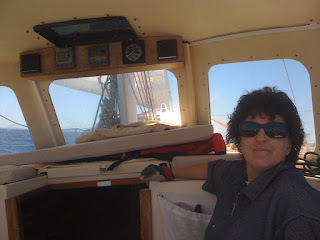 Pics Crazy Lady leaving Ulladulla Harbour, still pulling out the head sail and having a blast of a sail to Jervis Bay, Friendly faces night before naming ceremony, and Jen 25 knot gust no worries. Thankyou to everyone that turned up on Friday night to help us officially name CRAZY LADY. The generosity of our friends seems to know no bounds. I won't name you all here, but Moet was another treat, as well as the special xmas cookies and cakes,(I promise I won't eat them till xmas day), the 3 books are brilliant(have not stopped reading McTavish,) and the timber work and stairs are fantastic. Best of all your company is priceless, THANKYOU!! People seemed to come and go till about midnight,(Jens work mates later than most). The delivery crew from Secret Men's Business (Sydney to Hobart contestant this year) left for Sydney at about midnight. We helped them cast off. They would probably be in Sydney by the next morning, Sat morning!!!!!. They rafted up next to us, while they enjoyed dinner and a few ales at the famous MARLIN pub. They won the meat raffle and were quite festive on their return. Jen and I were invited on board to see what a $2million racing machine looks like. Picture yourself in a black tunnel with bunks stacked along each side and heaps of small 3 LED lights and just a computer on the middle line, and that just about sums it all up. Anyway we were given a weeks supply of meat as a treat. Saturday, saw a late start after showers and breakfast. We set off at about 11.30am with help from Big Al and pics(see above) from Kaye. 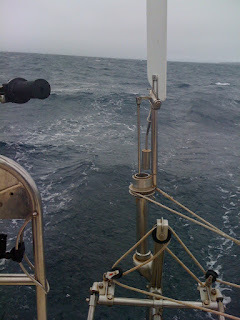 It was one of the best sails we have had in Crazy Lady, with constant 20 knot winds blasting us along at about 7 knots. The boat and crew handled these conditions beautifully. We picked up a national park mooring(3 attempts)in the beautiful Hole in the Wall area in Jervis Bay and had a nice BBQ and were in bed by 9pm. 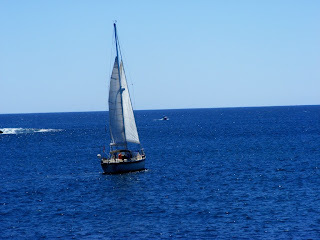 More on Jervis Bay in the coming weeks when we return to spend some relaxing times there. The plan on Sunday was to go straight thru to Wollongong, but sloppy seas and no wind soon made for a quick change of plans. We motored to Greenwell Point, about 20 nm from Jervis. My plan was to go up the creek and stay on the jetty at the caravan park. I had stayed there previously on Anembo, our slightly smaller previous boat. I must have forgotten some details in the past few years, because our new boat which is slightly deeper unexpectedly grounded in what should have been a deep channel. After kedging off (note the use of the nautical term) the sandbar, and much to the entertainment of cheering locals leaning over their balconies we picked up a public mooring in the river. Sounds smooth but it wasn't. The fun doesn't end there though. Later when lighting the BBQ under the continued gaze of curious locals, the cover of the Kettle that Jen spent 8 days making, blew into the water. My 1st thought was that its only a cover, no worries. I'll let it go. With horror I remembered how proud Jen was of this item, and being a natural born hero that I am I sprung into action. I leaped into the as yet unused dinghy to retrieve floating cover. One big problem being that I overlooked the stability of a regular dinghy which this was, and very different to an inflatable. Well you can guessed the rest, a complete and dramatic capsize of the dinghy with me(fully clothed) in the water and one oar floating speedily away with the outgoing tide to join the BBQ cover. Not to be deterred by the laughter of the locals, I quickly regained composure and was carefully assisted into new dinghy by Jen. I then did my best Hiawatha impersonation with the remaining oar, and rescued the cover and lost oar but nearly lost a boat hook in the process. Monday and Tuesday were rest days in Greenwell Point. Locals very disappointed. All we could manage was some very erratic rowing with a faulty oar grip against the strong tidal flow. We transported large quantities of washing to and from the laundry, and I carted 15-20 litres of fuel about a kilometre along the foreshore. Jen scrubbed the grubbiest parts of the Crazy with a scrub brush and Jiff for hours in the pleasant afternoon breeze. Wednesday: today: now. Wollongong Harbour. Tomorrow it's off to buy a new toilet, (did I mention that this trip started with a major toilet malfunction before we even sailed out on the first morning?) and to get the outboard motor fixed, which is why the dinghy oars are so vital at the moment. (Bruuuuuce I just can't wait until I see you again)Who said this cruising lifestyle is exotic????? 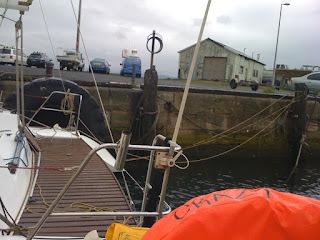 A leaking toilet, too much washing, fading communications systems and no time to get ashore to prepare for Xmas. Oh and if you were wondering about why we are late with the blog update, its because my invertor had some conflict with neg. wiring that I as an electrician created and was able to solve all by my self. Jen's off shopping with Brenna, and I hope they bring back some food. I was incharge of the food shopping prior to departure but foolishy thought that snacks would get us through. (see earlier blog) I think I might get my 1st surf in the morning at the beach were I learnt to surf at 45 years ago. We look forward to your correspondence and comments (and whinges if you know me well). Jen might say something when she gets back. 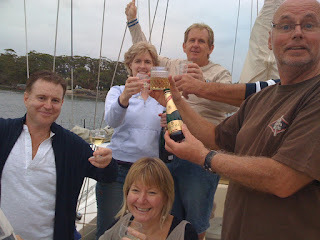 After a brilliant day of sailing from Ulladulla to Jervis Bay, We are now in Greenwell Point. 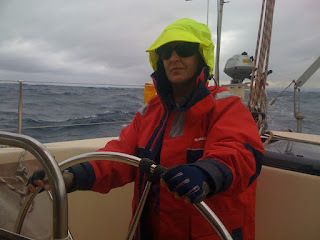 We motored up here early this morning, because there was no wind we decided not to continue to the Gong. Great night on Friday at the renaming ceremony,(thanks to those who turnrd up) pictures to be posted once we get to Wollongong, as well of more details of yesterdays sail and Jen stealing the meat raffle tray off the crew of Secret Men's Buisiness, we have run out of power due to some fault with the invertor (anyone know a good electrician) so I have to keep this brief. Complete blog and pictures in the next couple of days. The good news is that Jen is now baking muffins in the new oven, to celebrate our first grounding this morning. Goodbye Land - Hello Water. We have moved aboard, after a really crazy day where I kept forgetting what I was doing before I got it done. What do you mean, I hear you ask. One example, I decided to do the shopping for provisions, to help Jen out while she was busy organising everything else. Anyway after an hour or so roaming the aisles of Coles filling a trolly with all my favourite goodies and arriving at the check-out to have it all added up by the very efficient check out person, when Glenn realises he has no way of paying for it, ummmm I did offer to take all the things and put them back on the shelf, but the supervisor was called, and I was politely escorted from the store. Our neighbours Dennis & Denise, kindly fed us tonight then drove us down to the marina, we are very lucky to have such wonderful next doorers. If the weather is good, and its look like it will be, expect us in Ulladulla Harbour Friday arvo. We are both feeling somewhat strange tonight, trying to comprehend the start of our sailing adventure on Friday and the change of pace, lifestyle and finances that casting-off will bring. We probably should be really organized by now, but we both keep thinking of things that "must be done tomorrow". Today the liferaft and dinghy have been installed into their new positions, and tomorrow the food and kitchen pans and clothes. I'll miss my bed, because it's so comfortable for my "nurses back". I'll miss our new bathroom and laundry which is still a novelty even after 12 months. I'm struggling to decide what clothes to take because space is so limited. I want to take a range of personal sentimental things and photos too but the salt air may cause them to deteriorate. The sea motion also breaks lots of things. All of the decisions that need to be made on the details of arrangements is exhausting, but tomorrow night (Thurs) is the deadline because we will sleep on Crazy Lady from then onwards. 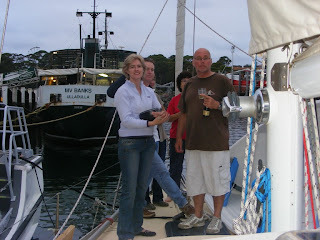 We will make an early start to sail up to Ulladulla from Batemans Bay on Friday morning. The renaming ceremony of Crazy Lady (making it her official name and deleting the previous one) will take place when enough friends and "bubbly" have arrived. I hope to see many of you there at 6 or 7ish at the wharf. We had a great day on Monday at Brenna and James uni graduation. It was great to see them both rewarded after 5 years of hard work. Well its Wednesday night and we have just returned from getting the boat ready, I installed the new liferaft today and a few other bits and pieces. 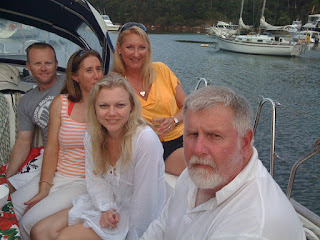 We set sail on Friday morning heading north to Ulladulla, for Jen,s renaming ceremony. The weather looks perfect to have us in Wollongong by Sunday afternoon, we will sail to Jervis Bay Sat and then to the gong Sunday, all being well. We move on to the boat tommorrow nite, so I will try and do a post from it, and try out my new mobile internet connection. Boat Naming AGAIN!!! Ulladulla Harbour Friday Afternoon. Well too tired, to say to much tonight, but if the expected southerly arrives Thursday nite, we will sail to Ulladulla Friday morning. Jen wants to de name & re name Crazy Lady at Ulladulla harbour Friday, all the usual suspects including Jens work colleagues + The Lake Tabourie Old Gay Surfing Association. This will also include a Bon Voyage for Jen and her long suffering crew. I finally finished work last Friday, and have to admit that I felt totally underwhelmed, I was expecting great burst's of euphoria from myself, I think having all these things to think about(what to take/or leave behind) before we go is kinda mind boggling, and those who know me, understand I caan only do 2 things at once and one of them is sweating. Jen has done a wonderful job getting Crazy shipshape in the last week, I'm really proud of her. Speaking of proud, Monday will see 2 proud parents at Wollongong Uni, as Jen's daughter Brenna, and my son James both graduate with double degree's. One must ask where do they get their brains from? We might even post some pics of the great day here. Those wanting sailing news will have to wait a few more days. "Three metres will be more than enough for the job." said Glenn. I had my doubts. On Saturday Dave willingly (!!!) lent a hand installing insulation around the engine room/space of Crazy Lady. It's a tight dark smelly space. The silver jigsaw in the photo shows the very last scraps of the awkward stuff being "patchworked" to fit onto the last door. I can't believe Glenn was so close to being right this time. 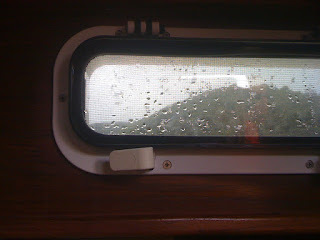 Dave and Gerti: a big thankyou, you helped make yet another THANKLESS BOAT JOB into a delightful day. Crazy's new stairs were installed on Friday. It's a shame that the photo is so poor. We no longer have to impersonate spiderman climbing down into and out of the cabin. Glenn dismantled the bulky unsafe steps without realizing how incredibly practical they were. Luckily our good friend Winni (James Patterson) had the skills to create a new set of steps that is so well crafted that it blends in with the established style of the interior. There's even a good luck messages signed under the top step. It was a wonderful day for me, watching him work with such precision. Many of our neighbours are taking the chance to say farewell now. This week I'll begin to load onboard every possible thing that we might need. The hardest part will be finding logical places to stow things and creating the master list of WHERE TO FIND IT. I've counted 84 different hiding spaces already. I should be really muddled by the time Glenn returns from his last day at work on Friday. I only have 6 more working days left, but hey who's counting? 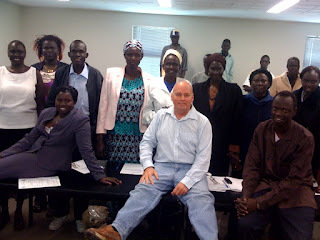 I had an interesting experience yesterday, training non english speaking Sudanese refugees Work Site Safety. We had an interpreter, who struggled to comprehend my sense of huuuuumoor. The irony of it was, that they had escaped from a war torn country, to then spend 2 years in a Kenyan refugee camp, and here I am talking about how not to get hurt at work. Doh!! More big boat news this weekend. Jens last day at work and the countdown begins. Jen finished work today, as our big adventure draws nearer. We have included a pic of the farewell poster Jen made for the staff at Sarah Claydon, Milton. One thing is for sure, the place will be much quieter without her cyclonic movements up and down the corridors. I'm certain I would get no arguments from her collegues, who have often threatened to pay me to keep her at home. (Frankie)The ransom has yet to be paid so we will be berthing in Ulladulla harbour in approximately 2 weeks time. So please start the collection now!! !